A popular Indian dish made with cottage cheese, cream and a blend of traditional spices. 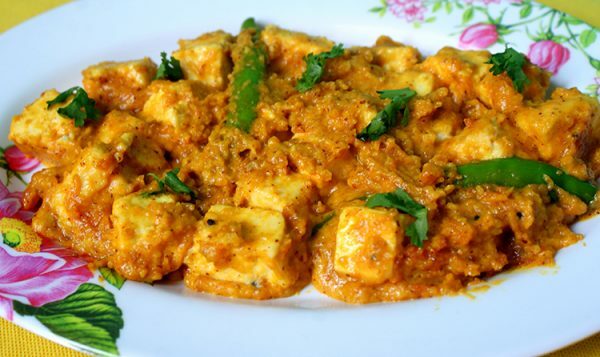 Cut the paneer (cottage cheese) into equal shaped cubes. Heat the oil and add the black cumin seeds. Add fresh cream and sauté. Slowly add mustard and groundnut powder and sauté till the mixture begins to thicken. Pour the water into the mixture and begin to stir slowly. Simmer on a low flame for 2 minutes. Add the paneer (cottage cheese) pieces and tomato sauce into the gravy. After this add the green chillies and cook on a low flame for 3 minutes till the gravy thickens. Turn the heat off and place the dish in a bowl, garnish the dish with fresh coriander leaves and green chillies. Side accompaniments can be a mixed salad and it can be served with roti, naan or steamed rice.